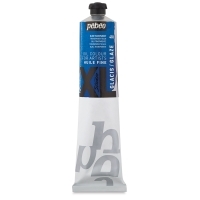 Decidedly modern, XL Studio Oil Color from Pebeo has been developed to fulfill the needs of contemporary expression. These colors mix easily and quickly, and their fast drying time allows artists to add new coats after only three days, perfect for glazes and impastos. They're also great for acrylic artists who want to try oil paints without the odor. The Pebeo XL palette includes both modern and classic fine art colors.